Place the chicken thighs in the base of a crock pot. Sprinkle the salt and pepper over the chicken. Place the thyme sprigs and minced garlic on top of the chicken. Pour chicken broth into the crock pot. Cook the chicken on high for 4 hours. After 4 hours the chicken should be “fall off the bone” tender. 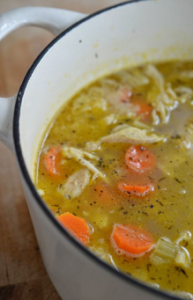 Remove the chicken from the crock pot and place in a bowl. Remove the thyme sprigs and discard. Add the broth back to the crock pot after straining. Turn heat back to high. Separate the chicken from the bones. Lightly shred the chicken. Discard any cartilage. Add the bones back to the soup and cover and refrigerate the chicken. Add the carrots, onions, and chopped thyme to the broth and cook on high for 2 hours. In the last ½ hour of cooking, add the kale to the soup. After 2 hours the carrots should be soft and tender, along with the kale. Remove the bones from the soup and discard. Check the seasonings and add more salt or pepper as necessary. Add the chicken to the soup and re-heat for about 10 minutes. Do not stir too much or the chicken will become over-shredded. Preheat oven to 400F (200C). Toss squash with 1 tbsp olive oil. Spread squash onto cookie sheet and roast in the oven for 20 minutes until slightly browned. Remove from oven and set aside. Meanwhile, in a large saucepan over medium-heat, add 1 tbsp olive oil, cumin and coriander and stir frequently for about 3 minutes. Add onion and cook 5 minutes, until clear, then add broth. Remove peel from squash if not already done, then add to pot along with half the cilantro and the jalapeño, if using. Simmer gently for 20 minutes or until squash is soft. Stir in 1 cup of the coconut milk, as well as the lime juice. Using an immersion blender, carefully puree until smooth. Season with salt & pepper. Garnish with coconut milk or vegan sour cream, and remaining cilantro. In a large soup pot or Dutch oven, brown sausage over medium heat. 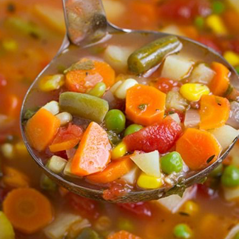 Add onion, bell peppers, carrots, celery, and zucchini and cook 3-5 minutes, or until crisp tender. Add garlic and cook 1 minute more. Add tomatoes and vegetable broth. Bring to a boil over medium heat and reduce heat to low. Add kale and simmer 20-30 minutes, or until ready to serve. Wash kale and working in two batches, stack the kale leaves and slice in 1/2 inch strips. Set aside. Add 2 cups of stock, the chopped onion and olive oil to blender. Blend for a minute or two, or until it is completely smooth. Add that to the crock pot and add the remaining 4 cups of broth, kale, shredded chicken, zest of all three lemons and the 2 tbsp of fresh lemon juice. Add a pinch of salt. Let cook for 6 hours on low crock pot setting, stirring once or twice. Bring chicken broth or water to simmer over medium-high heat in a medium soup kettle. Add chopped celery, carrots, ginger and cook it for couple minutes. While that’s cooking, heat the pan and add butter or coconut oil than add chopped onions and sauté until soft. Also add minced garlic to onions in the end. Add onions and garlic to soup kettle. Cook it for another minute or two. Cut chicken in small pieces. Add chicken to soup. Stir it well. Remove ginger chunks and basil leafs. Add coconut milk. Stir it again well and let it cook for 5-7 minutes. Add cilantro, cayenne pepper, lemon and little salt and pepper. Turn the heat off and let slightly cool before serving. Pour the chicken broth into a stock pot, and add the ginger, turmeric, garlic and fish sauce. Bring to a boil, then reduce to a simmer for 20 to 30 minutes to really infuse the broth with flavor. Remove ginger and turmeric. Add the chicken, mushrooms, green onions, carrot and zucchini noodles. Heat about 5 minutes on medium-low or until everything is warmed through. Taste and adjust the seasoning with sea salt. Serve with a drizzle of Siracha for some extra heat. To prep the kale, remove the leaves from the stem and then chop into small pieces. Open the can of tomatoes and put in a blender. Pulse twice to leave the tomatoes chunky. Add the olive oil and garlic to a large pot and turn heat to medium. Let cook for 1 minute, and add the kale. 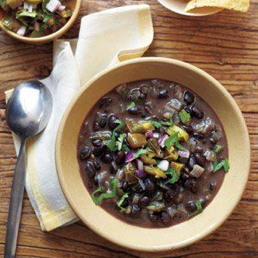 Cook for roughly 4 minutes and add the puree, tomatoes, black beans and spices. Stir everything together and let it cook for about 5 more minutes. Place the chicken breasts and salsa in the crockpot on low, until cooked through (start it before work and it will be done when you get home). Put lettuce in a bowl and top with the fresh ingredients and then the chicken and salsa from the crockpot. heat to medium. Let cook for 1 minute, and add the kale. 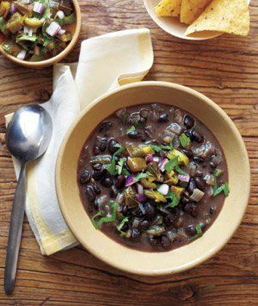 Cook for roughly 4 minutes and add the puree, tomatoes, black beans and spices. Stir everything together and let it cook for about 5 more minutes.